After owning a Bark Busters franchise in the west Chicago suburbs for 11 years, it only took a short while to realize I didn't want to give it up just because we moved to beautiful Southern Utah. And here we are, enjoying the great life and weather that southern Utah has to offer. I am a professional dog behavioral therapist and master trainer and have the pleasure of working with many amazing people and their dogs - any age, any breed, and any issue. Best Dog Training in St. George, Utah and Mesquite, NV! If you're reading this, then you're probably frustrated with your dog's behavior and you're trying to determine the best way to do something about it. You're thinking that you don't want to go to a dog obedience class because you don't believe a "one size fits all" approach is going to work for your pet. And, besides, who has the time or patience for a weekly dog training class with 15 other barking dogs? You don't want to send your dog away to one of those doggie "boot camps" because you're afraid her spirit might be broken, or fear that she'll return behaving more like a robot than a family pet. What about the dog obedience behaviors that only occur in and around your home? 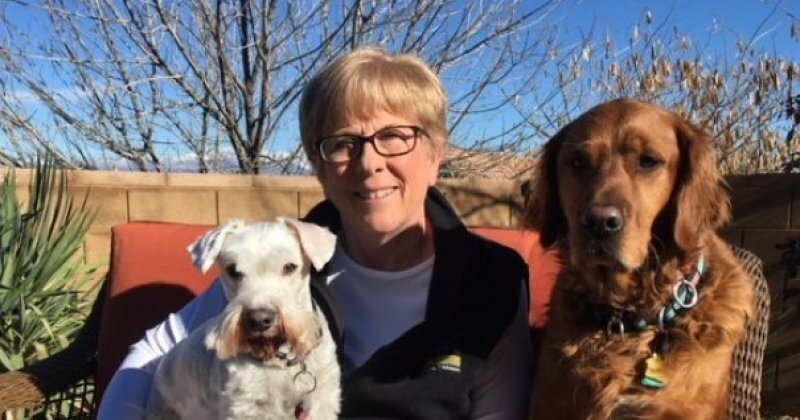 And you don't want to resort to dog shock collars or other coercive dog training measures -- Bark Busters Southern Utah/Mesquite focuses on POSITIVE dog training! Did you know that your dog probably doesn't realize she's misbehaving, or understand how frustrated you are with her actions? Often, a poorly behaving dog is doing her very best to fulfill her responsibilities as she understands them. The problem is that your dog doesn't understand your rules, and she makes bad decisions as a result. Therein lays the problem: you're not communicating in "dog speak." So, how do you get your dog's behavior under control in a way that is not only convenient and effective but will also result in a better relationship between you and your dog? Bark Busters shows you how to communicate with your dog in a language he understands, so you can give him the education he's missing and provide the dog obedience techniques he's craving. As a professional dog trainer with experience training thousands of dogs, I will teach you how to deal with your dog's behavior in a humane, non-physical manner. Most importantly, I realize that you need a dog training technique that fits with your lifestyle and the kind of relationship that you want to have with your pet, not some expert's opinion of how your dog is supposed to act. My goal is for you to have control of your dog(s) using voice and body language. Our dog behavior training philosophy is based on how dogs naturally learn and teach each other. We don't use harsh dog training techniques such as dog shock collars, which often do more harm than good. After you learn the Bark Busters dog training system, your dog will respond to you as his/her leader through respect, not just reacting to food or fear. Dogs learn best when they can focus on the dog owner and dog trainer without distractions. In their home, dogs are less stressed, and therefore you can focus on the issues and they learn very quickly. It's important for you to know how to control your dog in "real life" situations. We accomplish this through our private and personalized sessions that help you and your dog overcome the specific challenges you are facing and achieve your training goals. Simply stated when you succeed we succeed. Bark Busters was initially founded to help people whose dogs had behavioral problems and were in danger of being abandoned or euthanized. Such a mission is one of the reasons why I am here today. Whether you need mature dog training or puppy training, small dog training or large dog training, I am here to help. In just a few short dog training sessions, we can stop dog barking, dog jumping, separation anxiety or any other dog obedience issues you are experiencing. We use all natural and non-physical dog training methods to help you and your dog communicate more effectively. We customize the dog training to each individual dog and owner to address your personal situation and circumstances, and we make it an enjoyable experience! Take a step toward better communications with your dog today by calling Bark Busters in Southern Utah and Mesquite and ask about our Lifetime Guarantee. Jan was wonderful to work with! Very pleasant and really knows her stuff. We noticed a change in Dominoe right away. My sister and her husband had them out to their house as well. They were also very pleased so that's why we decided to give it a try. We will for sure recommend them to anyone who will listen! Our 11 year old dog is now deaf. Jan gave us a variety of management techniques to help us to work with him and still keep him a very happy dog. He is a really well behaved dog, thanks to previous experiences with Bark Busters. In fact, we have had three different trainers and all have been great to work with, patient, and informative. Jan was an absolute life saver! Our new family puppy, Sonny, was acting aggressive toward everything and everyone. With the guidance of Jan, she has taught us invaluable lessons on correcting Sonny's behavior in a caring way, and we are seeing results within days of her training. Thanks again, Jan! Well worth the price!